Provide your customers, guests or office staff with the handy Wrapped Cutlery Forks, White, 6-1/4" 1000/Carton. These break-resistant, medium-weight plastic forks are individually wrapped, which ensures maximum cleanliness and sanitation. 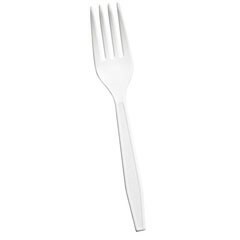 These high-quality white forks are available in bulk quantities of 1000.